Recently we had a dog that was diagnosed with sarcoptic mange or scabies. 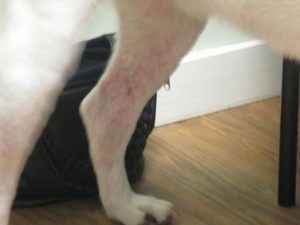 The dog was extremely itchy and started to lose patches of hair on his legs and underbelly. The owners were itchy too. A skin scrape was performed and this is what we saw under the microscope. Sarcoptic mange is caused by a parasitic mite (Sarcoptes scabiei )that burrows just beneath the surface of the skin. The mites feed on material in and on the skin. Sarcoptic mange is very contagious to other dogs and humans. 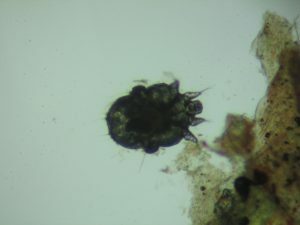 Although sarcoptes scabiei are not able to complete their life cycle on humans, they will cause severe itching until they die in two to five days. There are several medications that are effective against Sarcoptes. Treatments vary from medicated baths and dips to injections to oral medications. Some dogs will require a combination of treatments to resolve the infection. Secondary skin infections due to irritation from the mites should be treated as well. Bedding should be thoroughly washed in a diluted bleach solution to prevent re-infection. Dogs can contract sarcoptic mange from areas where large groups of dogs have been housed or congregate and from wild canines. Here in northern Vermont our dogs sometimes live in close proximity to foxes and coyotes who can be affected by this mite. Some of the medications used to treat sarcoptic mange can also be used as a preventative. They can be a combination of medicines that will treat more common parasites also such as fleas and ticks. Your veterinarian can help you decide if a preventative is the right choice for your dog.